Some little letter blocks I made from paper clay and stamps. Still haven't nutted out the style I am happy with but will keep working on it! And some hessian and lacy table runners - I might sell a couple of these, although I'm sure I could find places for them in my home - they are so pretty. I did get to the Craft and Sew Show in Newcastle on the weekend and had a fab time with my lovely friend Megan. We are going to definitely make it our annual thing! Will post some pics soon of the goodies I got!!! How gorgeous is she!!!! well done you clever lady...have not had a chance to get up to see you but I will!! !I promise myself lol...love both lots of mushies and the table runners are lovely. Saw her on your FB page Paula and commented, but she is very pretty. Well done! and ahh, you did make the blocks yourself? They look fab! I haven't been back to check if you'd answered me on FB sorry. Where did you get the paperclay and is it a good one to use? 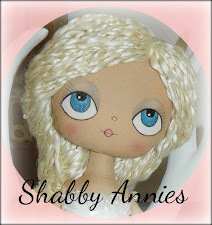 I'd love to get some to make dolls heads but I believe they aren't all as good as they could be. Now your mushies......they are all so gorgeous! Can't really make my mind up which I'd prefer either! :) But know how I love to work with mixed media, I'd probably go with the self covered buttons and reels. LOVE them!